Cover crops, also known as ‘green manure,’ are planted specifically to maintain and improve soil quality rather than being harvested. Properly planning and executing cover crops can protect and improve farmland in the times between cash crops. Join us as we dig into the benefits of cover crops, maintenance tips and some great spring and summer planting options. 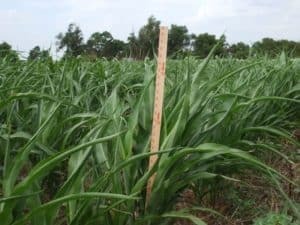 Sorghum sudangrass is unrivaled for adding organic matter to depleted soils. Here are a few tips to help you choose and maintain healthy cover crops. Decide what times are available to plant based on your rotation and production objective. Select appropriate cover crop species that meet both your specific targets and that can be used in your window of opportunity. Keep at it. Cover crops require a long-term investment and commitment. Keep experimenting and working until you start seeing the results you desire. There are a few signs that can indicate unhealthy cover crops – a lack of good stand establishment, spotty germination and no growth. As you move forward with caring for your cover crops, it’s important to consider your previous and planned herbicide usage along with your cover crop and cash crop rotation. Herbicide carryover can be a major factor in inhibiting cover crop stand and development. More information on that here. Depending on what resource concern you are using cover crops to address, what your window of time is and your budget, there are a wide variety of cover crop species available for spring planting, like: oats, sorghum sudan, sudangrass, teff, buckwheat, sunflowers, alfalfa, clovers, field peas, guar, vetch, lablab, cowpeas, soybeans and sunn hemp. We keep many of these individual products in stock, as well as a base cover crop/cover grazing mix. We can also create custom cover crop mixes that will best suit a customer’s specific needs. For more information on cover crops, visit our resources for professionals page or contact us.